This page is dedicated to all the folks who've seen abandoned buildings by the roadside and thought, "I wonder who used to live there?" An abandoned house along Route 50 in Virginia. I've always been fascinated by abandoned buildings and local history. When I was young and crazy (instead of old and crazy like I am now), I often visited the library and studied their old F. W. Beers Atlas of New York City & Vicinity. It was extremely helpful in locating where the old roads went in order to compare them to modern-day maps, allowing me to find places that weren't there anymore. As a result, I've explored a wide variety of defunct and disused places: state police barracks, iron-ore mines, railroads, steel mills, mansions, tunnels, bridges, military bases—sometimes even entire towns which have vanished off the map leaving little trace they existed. Over the years I've accumulated a significant collection of pictures of these places, so I thought I would share some of them on the internet so others who are interested in these crumbling old ruins can see them as well. These pages mainly focus on abandoned places on the East Coast from New York to Virginia that I've explored. Enjoy! Bannerman's Castle. Located on Pollepel Island in the Hudson River, Bannerman's Castle was a former weapons arsenal which was closed in the late 1950s and was purchased by New York State in 1967 as part of Hudson Highland State Park. Briarcliff Lodge / King's College. Briarcliff Lodge was originally built by Walter Law in 1902 as a summer resort. In later years it became King's College, a Christian college, before being abandoned in 1994. A fire devastated the main building in September 2003, and all the buildings on the campus have since been torn down. New York Central Putnam Division. Winding its way through Westchester and Putnam Counties, the Putnam Division began passenger service in 1881 and ended in 1958. Freight service continued until final abandonment in the late 1970s. The former right-of-way is now a bike path. Paulinskill Viaduct. Completed in 1911, the Paulinskill Viaduct was part of the Lackawanna Cutoff. The railroad was abandoned in the 1960s. Centralia, PA. Centralia was a thriving coal-mining town with a population of 1,100 until a fire started in a trash dump in May 1962. Most of the residents moved out in the 1980s, due to the fire that still burns under the town today. At last count there were only 6 people left. I have been visiting Centralia for many years. It is said to be the inspiration for Silent Hill. Nicolet, Inc. Located in Norristown, Nicolet was an industrial asbestos and insulation manufacturing plant. The building was demolished in 2012. Vanished Troy Hill. I didn't get a chance to explore this, but I am in the process of documenting the buildings that were demolished by the Route 28 expansion in Troy Hill, near Pittsburgh, PA.
An abandoned house located at 43608 Ryan Corner Place in Ashburn that was demolished to make way for an apartment complex. An abandoned house located at 1009 Ruritan Circle in Sterling which has been demolished. Located just off the Fairfax County Parkway in Herndon, the Evelyn Davis House was demolished in 2002 to make way for luxury homes. Located just off the Washington & Old Dominion Trail in Leesburg, the Fiske House was demolished to build a parking lot. An abandoned house on Sycolin Road in Leesburg is considered "dilapidated debris" by town planners. 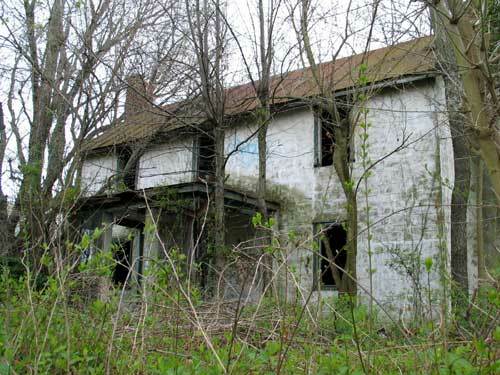 The abandoned houses of the former town of Willard, VA.
Where to Find Abandoned Buildings? Visit our online store for books about abandoned buildings! Urban exploration can be dangerous. This website should not in any way be considered encouragement for anyone to ignore posted signs or trespass on private property.